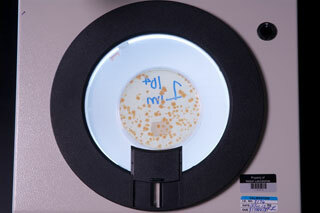 The Biological Indicator Population Verification test determines the number of spores on a biological indicator (BI) and is typically used to verify the BI manufacturer’s labeled population. This test can also be used to enumerate survivors from a sterilization process to determine lethality rates and D-values. Initial population verification is necessary because the population of the BIs can change during shipping and/or storage. Population enumeration on samples exposed to the sterilant is also important because it provides quantitative data whereas a BI sterility test only provides growth/no growth results. Testing requirements are outlined in USP <55> and ISO 11138. Our experts have the capability to perform testing on all types of biological indicator configurations such as BI strips, disks, stainless steel sutures, inoculated wires, and spore suspensions and can offer one-on-one guidance. Please contact our Study Director for more details on the standards, samples, and testing requirements appropriate for your product. In Biological Indicator Population Verification testing, BIs are macerated using a validated technique such as blending or by sterile glass beads. Other methods can be used as required. After heat shocking, the suspension is diluted to yield colonies in the range of 30–300 colony-forming units (CFU) and then plated. If you have additional questions about Biological Indicator Population Verification test services, or would like to consult with the experts at Nelson Labs, just send us a request or call us at +1 (801) 290-7500.